The Chicago Bulls actually won a basketball game on Wednesday night, taking down the Miami Heat 105-89. 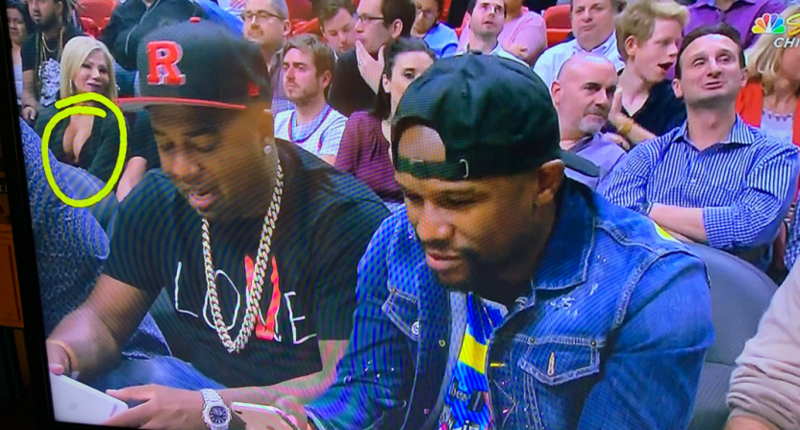 Floyd Mayweather was on hand at American Airlines Arena to watch the game, so the Bulls’ broadcast on NBC Sports Chicago had the camera focused on Mayweather coming out of a commercial break. Well, the return from commercial caught someone with the NBC Sports Chicago broadcast off guard. The telestrator wasn’t focused on Mayweather, but instead a women’s breasts in the background. Bulls color commentator Stacey King usually is in charge of the telestrator during games, so naturally the Twitter sleuths are pointing in his direction. Someone may be losing their telestrator privileges after that one.